All new for RE/MAX Oaktree in Stellenbosch. 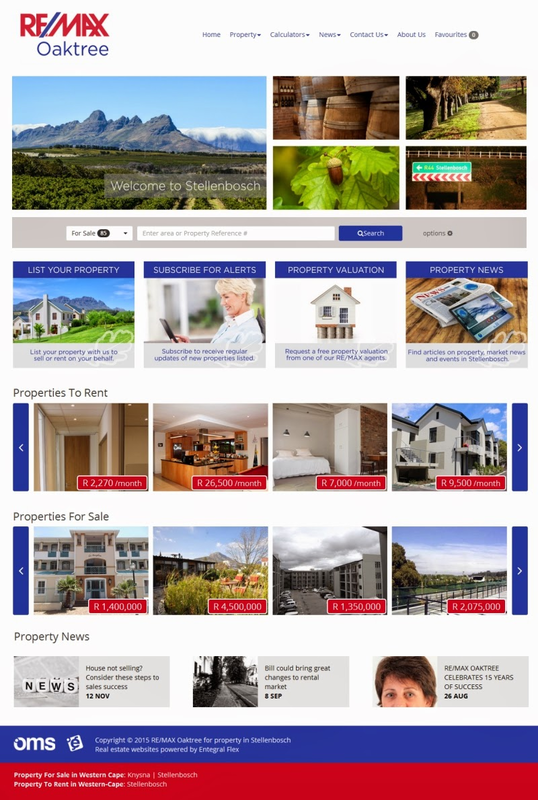 A new year, new owner and new website for RE/MAX Oaktree in Stellenbosch! One of the very first RE/MAX offices that joined Entegral was the one that you can find in the famous and historic Dorp Street in Stellenbosch. This RE/MAX office specialises in the sales and rentals of various kinds of properties in Stellenbosch. RE/MAX Oaktree has currently undergone change in ownership. This office is now owned and headed by Deon de Swardt. The change in ownership also resulted in the change of their website. The new owner of this RE/MAX office ordered a brand new website, based on our responsive web design framework. This new website is managed by the agents themselves by means of listing their properties and using all other available functionalities online via Entegral's Office Management System. This website is based on our Elevate theme and special features like property alerts, request a property valuation and list your property were added to personalise this website for RE/MAX Oaktree. You can have your own real estate website setup within a few working days at minimal cost. Visit www.entegral.net to find our more about this unique product offering designed for the real estate market.